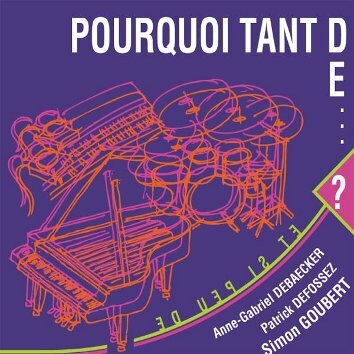 LEO RECORDS: CD LR 608: Anne-gabriel Debaecker - Pourquoi Tant De...? The French duo "Autres voix de piano" (Anne-Gabriel Debaecker - piano / electroacoustics, Patrick Defossez - piano) invited one of the main figures in French jazz, the drummer Simon Goubert, to perform a SUITE that combines instrumental sounds and electroacoustic textures in an architecture that is based on both the written music and exuberance of improvisations. A SUITE that allows space for solo, duo, and trio. A magic triangle of artists where the spirit of jazz continues to inspire the development of new sounds.